While IAM bosses rake in hundreds of thousands, Machinists union members making $10 per hour go out on strike. 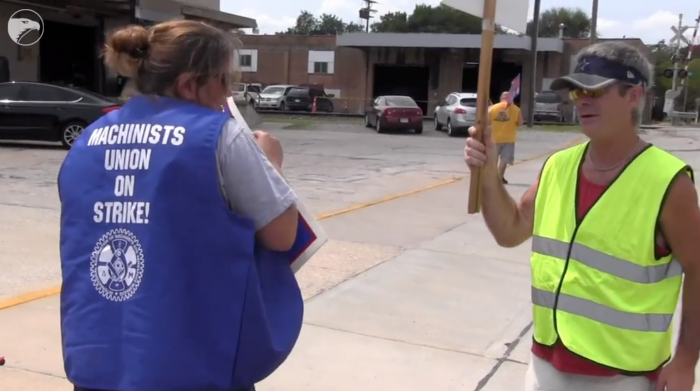 While Machinists union bosses rake in hundreds of thousands of dollars per year, nearly 40 Machinists Union members–who only make $10 per hour—went on strike in mid-August at a auto parts retailer and warehouse, according to the Wichita Eagle. The union’s contract with Garnett and Jobbers expired July 31. The workers are represented by the Machinists Local Lodge 708. Cornell Beard, president of Machinists District 70, which includes Local 708, said on Friday reasons for the contract rejection are “all take-aways” — cutting things such as benefits or wages that union members have in their current contract. “The company is not interested in the simplest things, not even cost of living (adjustments),” Beard said. “The majority of members there . . . don’t even make 10 bucks (an hour).